Reagan slept well last night. After sleeping all day long, she woke up right before the night nurse got here at 10pm. She was happy and sweet and the night nurse was loving it. She finally dozed back off sometime around 11:30pm. She slept but it was a restless sleep. Her nurse put her in bed but picked her back up and took her in her therapy room because she was moving around so much in her bed. She did sleep though, so that's good. She woke up a little congested. I don't know if it was from all the sleeping yesterday and breathing through her nose or what (she wasn't congested the day before). The fingers have been constantly in the hair or in the mouth again today, but what can we do, she does what she wants!! Overall she's been a good girl today but very vocal and at times an agitated/on edge vocal. There were a few times that we thought she was going to meltdown completely but she did recover and we made it through the day without any tears. It was touch and go though. She did OK with OT this morning, but did NOT like her therapist talking to the nurse. Again during Speech she had another mini meltdown and then during PT she was crazy vocal pretty much the entire time. So not a great therapy day. Tonight she's been super vocal, but it's almost like she's trying to talk to us! She's finally giving us some yawns at 11pm, so hopefully that means she's going to sleep tonight! No night nurse tonight! One last reminder...this weekend is the Houston UMDF Energy for Life Walkathon, so any one that wants to join us, please register now! And if you can't join us, please consider donating! Definitely a worthy cause! Now...we've just got to get Reagan to cooperate with us and continue having good days at least thru Saturday!!! Reagan slept the whole night last night...and then the whole day today! I guess I wasn't all that surprised. She did have the laughs yesterday and the day before (and the laughs are usually followed by a day of sleep). She did wake up a couple times today but only briefly. Once this morning when I had to get her changed so we could escape out of the house while the exterminator sprayed (we've got fire ants that have invaded our house and we're not sure where they are coming from). She did get slightly agitated, but I think that was because her brother was being so fussy and high maintenance! I gave her a half dose of clonidine (since she skipped her dose the night before) and then she was back out! So needless to say, no therapy was done today and I had to cancel school once again (she hasn't had "school" since before Christmas break)!! Hopefully our little sleeping beauty sleeps tonight and wakes up a happy girl tomorrow! Time for this mommy to go to bed! Reagan slept well last night. She woke up this morning all smiles and she's been a good girl all day! She had OT this morning and she did great with that. Her therapist did some oral work and that may have encouraged her a little too much! She's been chewing on her hands all day today...fingers half way down her throat! Her fingers are all shriveled up from being so wet. She's also been pretty spitty...I actually don't remember the last time she was this spitty! But she's smiley. And laughy...but not too laughy. Just right. I actually think the reason she's been so mouthy today may have to do with the fact that she's teething! She's already got both teeth breaking through her gums! Not only is she losing her teeth quickly...she's getting them quickly as well! (Of course, we were hoping to enjoy some time with her toothless...less to worry about when she's upset and biting!) This afternoon she had PT and after she did an hour in her stander, no problem. She really has been a good girl today. Hoping she can hold out and continue to have good days at least through Saturday (the day of the walkathon)!! Reagan slept well last night (unfortunately her brother didn't have a repeat of the night before and he woke up quite a few times)! She woke up happy and she's been in a great mood all day. She woke with a dirty diaper so we immediately changed her into her clothes for the day. She was all dressed and ready to go to her appt (and we were already running a little behind) when we went to pick her up and found she had pooped AGAIN only this time it was all over her chair, all over her new clothes, it was everywhere!! Eventually we got her cleaned up and we were on our way. Of course, we were about 10min away when I realized we had left her stroller at home!! Thankfully Ryan's Maclaren Quest was in the car so we were able to use that (and just carry Ryan). 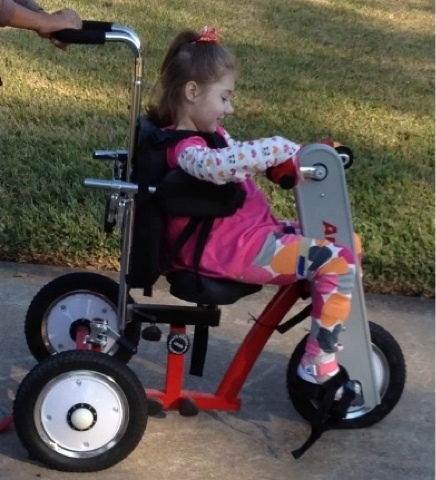 The interesting thing is, since it has an extendable leg rest (that her Triumph didn't have) keeping her feet out of the wheels and off the floor, it actually works quite well for Reagan...who knew?!?! We got to the building and I realized I didn't know what floor this neurologist's office was on. I asked the lady at the information desk and she told me the 7th floor. We went up to the 7th floor and walked back and forth several times, but didn't see any sign of it. So we had to go all the way back down to the first floor and ask again. She said maybe the 5th floor. So then we went up to the 5th floor and they told us it was on the 7th floor!!! Ugh. We went back up to the 7th floor and finally we stumbled upon the office...I don't know how we missed it...it said Cardiology on the door!! Anywho...we signed in and they tell us it will be a minute. An hour and a half later, we are still sitting in the waiting room!! Ryan is fussing up a storm because he hasn't taken a nap and is hungry! I talked them into putting us in a room (so I could at least feed Ryan) and we waited some more. A resident came in and got all of her history, my concerns, etc... He was very thorough. After waiting some more, the nurse practitioner came in. He informed us that the doctor had been called away to a surgery and that we had to talk to him instead!! Seriously?!?!? What a waste of an appt. After all the hassle of getting there and all the waiting and we still didn't get to see the doctor!?!? Ugh. So...long story short...we're going to get her in for a 23hr EEG and then reconvene. They also want her to have another MRI at some point, since it's been a couple years since her last one. So despite all we went through, Reagan was a complete angel the whole time. She's had the laughs today (unsolicited laughs, but more sweet than crazy) and was super cuddly. So glad she's feeling better. Probably thanks to the two dirty diapers (it had been almost a week without one)! Last night was AWESOME! Ryan slept from 8:30pm-6:30am, I got up and fed him and then put him back down til after 8!! Reagan slept through til just before 8 as well! Of course, I didn't go to sleep til after midnight, but I'm still excited about six consecutive hours of sleep (yes, I know, sad)!!! Reagan has been much more stable today. She was pretty nauseous this morning (makind a lot of gaggy faces) but I drained her g tube and that seemed to help a little. Overall she's been content but still having lots of chorea. And she's still really wiping at that nose. The whole left side is bright red! I'm not sure why she's doing that. I don't know if it's an allergy thing and it itches, or if it's just some weird neurological craziness. 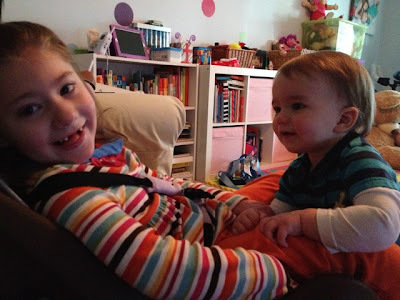 Speaking of neurological craziness...she's got an appt with a new neuro tomorrow. I've got a whole list to go over with her. I'm hoping for some good input. Reagan's EEG isn't until next week, but it's one of the short ones that's barely worth the trouble of putting on and taking off all those leads! I'm hoping she's feeling even better tomorrow...thank you for keeping her in your prayers! Reagan did not have a good night last night (to say the least). She woke up around 3am crying. Daddy tried to get her back to sleep, but it just wasn't happening. I gave her another dose of Lortab and he moved her into her chair where she eventually fell back to sleep. Today has been much of the same. Waking up, crying the whole time she's awake, and then eventually falling back to sleep usually with the help of medication. We did finally try the morphine today. We started at a low dose and didn't see much of a response after the first dose. We kept the second dose the same but it seemed to work a little better (although she would still wake up occasionally thrashing around and crying). Thankfully we didn't see any signs of an allergic reaction and her breathing doesn't seem to be affected at all (I was very nervous after the whole methadone incident). The doctor told us we could increase it, but there's no chance of me doing that at night. I also picked up some samples of a new formula Nutramigen AA. It's very similar to Neocate and EleCare, but it's worth a try. Again, I'm not going to make any changes at night, so I'll start her on it in the morning. Please keep it in your prayers that our girl sleeps tonight and wakes up feeling better tomorrow (and that this new formula is the piece of the puzzle we've been looking for)! According to Reagan's night nurse, she did finally go to sleep around 1:30am and then slept through til just before 8am. Not bad. She was smiley this morning, but you could definitely tell she was a little more on edge. Lots of kicking around, still having temperature regulation issues. She had OT first thing this morning, followed by speech. She did well with both. She ate really well again during speech despite being a little spitty/gaggy this morning (keep in mind, really well for her means 1-2oz max)...this time it was pear raspberry with oats. Then during PT we put on both pairs of her AFOs and were discussing all of the problems with them, and you could tell she was getting frustrated. I don't know if it was the AFOs hurting her, or just us talking, but she started to get agitated and was fussing a little. She was OK though the rest of the day. We gave her a bath and got her pjs on and she started getting a little agitated again. Then the crying started. I gave her a dose of Lortab and then she seemed to calm down. She didn't want to be messed with and she didn't like the loud television, but she was OK. Then just before 11pm the crying started up again! I gave her her bedtime dose of clonidine and eventually she settled down and fell asleep. She's OUT. I'm hoping and praying she's able to sleep the night through and maybe, just maybe, wake up feeling better tomorrow. I can hope, right?!?! Please keep our girl in your prayers! It's been a nice run of good days...I was sure hoping we could string a few more along! Reagan didn't sleep much last night. I'm not sure if it was because the night nurse was here and she just wanted to sit up with her, or if she is getting back into her not sleeping mode. Whatever the case, she was very restless and only slept a little off and on. She's been sweet and smiley again today. She only had one therapy, speech, but she did great for that. Then we went to the orthotic place to pick up her new AFOs. When we went to have her cast 2 weeks ago, she slept the entire time! Today she was moving and kicking up a storm! She almost took the orthotist out a few times! Of course they only had one pair of her AFOs, so we had to wait while someone drove in from their other location with her second pair! We were there two hours or so total and brother was not nearly as patient. And we'll be heading back again at some point because she cut down one of them way too short and her big toe is hanging out! Not gonna work! So they are going to have to remake the whole thing because she cut off too much! Not sure if that means we have to wait another two weeks or what. The night time "dynamic" AFOs (that have a hinge in them so they stretch her when she's relaxed) look a little better, but I'll have to try them on her again just to make sure. I'm not so sure we'll really be using those at night...my girl has enough sleep issues. 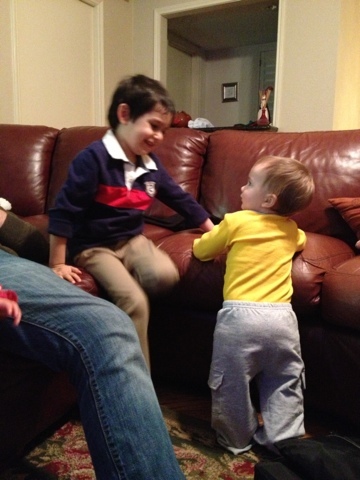 Anyway, Reagan was great all day until tonight when her brother was pitching a fit and screaming his head off! That set her off and she began crying! It was hard to get her to stop, but once her brother was out of the room, she eventually calmed down! She was OK the rest of the night. Her temperature control is definitely way off right now. Her back is sweating so badly she's soaking the back of her shirt, meanwhile her feet are ice cold! What are we going to do with this girl?!?! I did finally hear back from the GI doc and he's in agreement in trying a new formula. He said that her egg white allergy is significant and that if she's that allergic to egg whites, it's possible something else could be aggravating her as well. His nurse is supposed to contact me about the details. It sounds like we'll either be trying Elecare (which is almost identical to neocate, but for some reason some people do better on one or the other) or some other elemental formula. I hope it helps. Prayers that my girl can hang on and continue to have good days...(and please keep her friend Abe in your prayers as he is in the hospital hoping to find a solution to his seizures)! Reagan slept well again last night and then woke up all smiles again this morning. She's been in a great mood today. Very smiley, very content. Really no agitation whatsoever. She had OT this morning and PT this afternoon and did great for both. 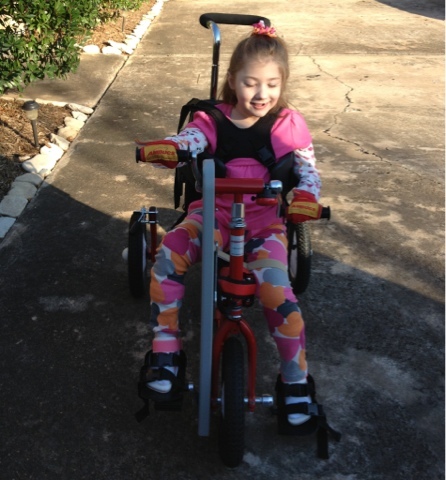 After PT we took her out on her tricycle, it was so nice outside. We made it all the way to the end of the driveway before noticing her front tire was completely flat! Reagan sat in the grass with Grandma while I went from neighbor's house to neighbor neighbor's house and still couldn't find an air pump (Mike had ours in his truck)! Oh well. At least she spent some time outside! All in all, it's been a great day for my girl. Her feet were a little cold tonight, so she is starting to have some temp regulation issues again, I'm just hoping she hangs on for at least one more day! We're supposed to go pick up her new AFOs tomorrow, so I really need her to behave! She's fighting sleep right now, but we have a night nurse tonight so I know she'll be well taken care of. Hopefully she sleeps! Reagan slept well last night and then she and her brother both woke up this morning at exactly 7am! She's been a good girl again today. She's been sweet and smiley, but also quite vocal with the occasional high pitched squeals that could really go either way. She had OT this morning and did great for that. She even did a little oral therapy and had a taste of some food (raspberry banana oatmeal). 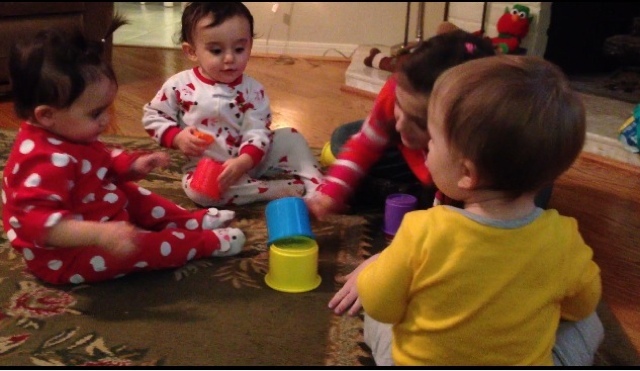 Then an hour or so later she had speech therapy and went to town with the apricot with mixed fruit baby food! Her therapist said she ate better/more than she's ever eaten (I guess that flavor was a hit)! What's even better, she didn't seem to have any problems whatsoever afterward. Sometimes she'll sound a little junky in the throat or seem a little gaggy after eating. None of that today. 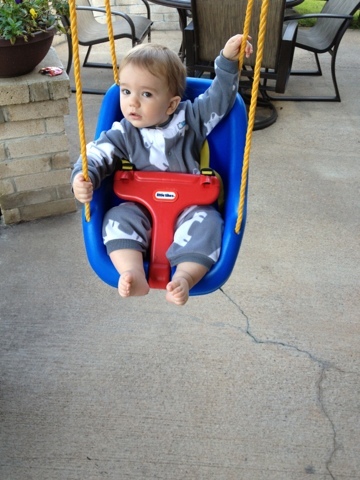 Then this afternoon she went outside to swing for a while. It was a really nice day and her brother even went swinging next door in our neighbor's baby swing (although he's still a bit leary about swinging). So another pretty good day for my girl. Mommy got lots of cuddles today, so a pretty good day for mommy as well! Hoping she'll continue to hang on and give us another good day tomorrow! Reagan continued sleeping last night and then slept through til this morning! She woke up in a good mood and has been awake and a good girl pretty much all day. She was definitely happy to see her Grandma (and so was her jealous brother). She's still pretty congested and even sneezed a couple times today (mommy was sneezing nonstop...something must be in the air today). She was fairly laid back most of the day, but tonight she started getting vocal and sounded a little on edge. We gave her an early dose of clonidine and got her to bed, so hopefully she sleeps it off. She's a little restless so I hope she stays asleep. Praying for at least a few more good days!! Reagan slept well last night. Very well. She woke around 10:30am and was back asleep by 11:30! She slept the whole day through, waking again around 9pm and dozing back off before 10! That's one sleepy girl! When awake, she seemed content, so hopefully we're in store for a good day tomorrow! Grandma is coming in tomorrow, so she's really hoping for good days! Below is a picture of my sister in law and her husband. They had a garage sale today with all proceeds going to our walkathon team Rallying for Reagan! How great is that?!?! If you'd like to donate to the walkathon or join us on Feb 2nd click here. Reagan slept well last night...in her bed! She woke up and was kicking and laughing around 6am but then she fell back to sleep and slept til 8:30 or so. She's had the crazy laughs today. Big time. She's seriously laughed all day long! It's certainly better than crying, it's still a little odd. She was real laid back and calm this morning. Very little chorea, a little groggy. Then this afternoon/night she's kicked it into high gear and she's kicking around nonstop! Her temp regulation is back off again. I noticed when I gave her a bath tonight her left arm was bright red (kinda like her ear gets). Not sure what exactly that is, but it's obviously linked to the temp regulation issues/dysautonomia. She's also been gaggy off and on today. She was more so this morning, then it faded and then tonight it's back a little. She's also doing the weird arm movements that resemble a startle. She's been doing it off and on tonight (and blowing on her can also cause her to do it)...I don't like it. Looks too much like what she used to do (although she has had an EEG when she was startling in response to blowing on her and they were NOT seizures). I'll definitely bring it up during her neuro appt on the 28th (I also took a video of it, just in case). I'm hoping she's able to sleep tonight...praying we can get these laughs to ease up, so she can get some rest!! Sleep was about the same last night. The night nurse was here, so Reagan spent most of the night on her lap sleeping! It's been a pretty good day for my girl. She had OT this morning and PT this afternoon and she did well with both (and even made it 45min in her stander before a stinky diaper forced us to take her out)! After OT, we headed to Reagan's GI appt. We were seeing a doctor per recommendation of her regular GI...he thought he might have some new insight. He also is at the satellite office that is about 10min from our house! I don't know if it was just the time of our appt (10:50am) or what, but the office was empty and they took us back immediately. We waited a little while in the room but as it turns out, the doctor was going through Reagan's chart and actually familiarizing himself with her case beforehand (what a concept)! He really wants to get to the bottom of what has been plaguing Reagan (and us)! The first thing he brought up was her formula. Why Neocate Jr? Does she have any allergies? What if she's allergic to something in this formula? If allergies aren't the problem, maybe it's bacteria. Overgrowth of bacteria in her GI system could cause gas accumulation that could also be painful. So treatment with an antibiotic might be in order. Something to increase her gastric emptying. Is she for sure still having acid reflux? These are all things we are going to look into. He took a lot of blood and we're going to reconvene once he gets the results. (Oh, and he also lives in our neighborhood!) So definitely a productive appt...so glad we went! 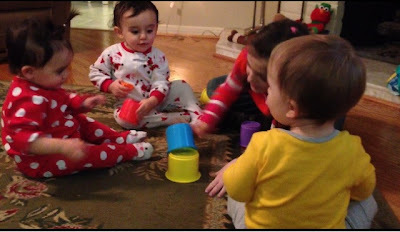 Tonight Reagan has been a little gaggy and a little laughy. Some crazy laughs...especially when it was time for bed. I'm hoping she'll sleep tonight. No night nurse tonight! Thank you for checking in on our girl! Hopefully good things will be happening for my girl in the future! She deserves it! Reagan slept fairly well last night...granted it was in the arms of her night nurse, but she did get some sleep nonetheless. She has been a good girl again today. Still not happy, per se, but calm & content. We've gotten a few little laughs, but nothing crazy. She had lots of therapies today. Speech, OT, and then Speech from the school. She did well with everything. She got so relaxed with her speech therapist stretching her, she ended up with a leaky poopy diaper and her therapist needed a change of pants! (I always tell her therapists and nurses to keep an extra set of clothes handy because you just never know!!) That was the first of two dirty diapers today. It comes and goes. She'll go days without any and then pow (or should I say poo)! We've got an appt with the new GI tomorrow so I'm interested in seeing what if anything he has to say about all of this. Time for bed. Hoping my girl sleeps tonight, even if it is in the nurse's lap! Reagan had a rough night last night...and so did we. I tried sitting with her for a while so Mike could sleep, and I even (eventually) got her to fall asleep by holding her arms down with my body. She woke back up and was fussy but not actually crying...so I left her alone. Finally I went in and pinned her arms back down, it was then that I noticed she had yanked her other loose tooth out (by biting at her arm restraint)! Once restrained again, she finally dozed back off and then slept through til 8:45am. She woke up and was a tad fussy, but nothing compared to yesterday. At first it seemed she just wanted to be left alone (not a fan of diaper changes), but as the day went on she was more and more OK with it. She had OT this morning and PT this afternoon and she tolerated both remarkably well. Then this afternoon only moments after the nurse left, she had a huge liquidy diaper! Perfect timing! Thankfully, Daddy was already home, because it took two of us to clean it up! Tonight she's been pretty laid back. A little gaggy, making coughing/gagging noises here and there but nothing actually coming up. We do have a night nurse tonight, so hopefully both her and us get some sleep tonight! Prayers for a better day tomorrow! On a good note...Reagan slept last night. She was very restless and Daddy laid with her for quite a while to finally get her to sleep. But she slept. She slept til about 9:45 this morning. The bad news is, she woke up crying and continued to cry the entire day! Thankfully, we did have a nurse today. We actually had TWO show up this morning (usually we have the opposite problem)! Anyway, God bless the nurse that stayed because it was quite a grueling day. Nothing helped Reagan today. Nothing. We tried Lortab (twice), Toradol, regular ibuprofen, clonidine...nothing worked! She only dozed off twice all day and only for 30min or so each time. And she was crying...real tears, holding her breath and turning blue crying. Not good. You just feel so helpless on days like this. You question everything you're doing. Are the medicines making things worse? What on earth can we do to help her?!?! I sent two emails out tonight to mito specialists on either side of the US to see if they might be able to help. We are willing to go where ever we need to in order to help our girl! Someone has got to know something about this, right?!?! We have an appt with a new GI doc on Thursday and hopefully we can get some insight from him (our other GI thought he might be able to help). I definitely think we're dealing with some sort of GI pain, but what is it and how do we treat it? I don't know. Please keep our girl in your prayers...if she could just get some sleep and sleep this off!!! No night nurse tonight, so keep us in your prayers as well! My girl still is not sleeping well. Daddy spent a good portion of the night trying to get her back to sleep. Our nights are starting to blend together...it's hard for me to remember which is which. We go to bed way too late every night, wake up multiple times with one or more kids, and then wake up way too early each morning. Not good. Not good. Reagan, on the other hand, has been surprisingly good again today (this was not the weekend we had anticipated...and I mean that in a good way). She's been a sweet girl again today...putting up with more than her fair share of her brother's whining and crying. She did have another meltdown, when we were talking just a little too loud (still very sensitive)...but overall she's been good. Her temperature regulation has been WAY off...she's sweated her back wet many times today (but her hands and feet are cold). And the chorea really kicked it into high gear tonight. She couldn't hold still for a second and was so tense, it was hard to hold her! I think I know where we're headed...I'm just glad we had a few extra good days. Please continue to keep her in your prayers! Last night wasn't such a great night. Reagan woke up and was very vocal and on edge. Daddy spent quite a bit of time with her trying to calm her down. She was kicking and flailing all over the place. 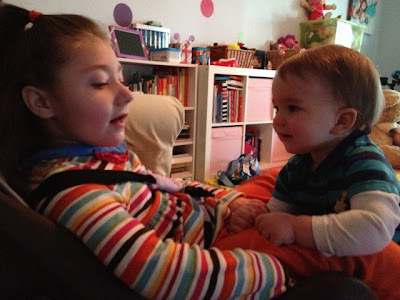 Eventually he put her in her chair and immediately she calmed down and was still. She did get some sleep, but I'm not sure how much. The most amazing part...she woke up this morning in a good mood. Probably better than she's been the last couple. She was still a little sensitive, but overall she's had a good day. She had speech therapy (her therapist made up a session missed from last week) and did well with that. Most of the day she was pretty calm and quiet. It wasn't until tonight that she had an increase in chorea and then a couple of crying meltdowns from Daddy yelling at the football game and just loud noises in general (that includes her brother). She's still slightly congested and she started up with some little coughy/chokey noises again tonight (but didn't do it all day long). We've definitely been skating around the bad days for a few days now. Hopefully she can continue to hang on and have another good day. Please keep her in your prayers! Reagan fell asleep last night in her night nurse's arms but then was back awake before we went to bed (at midnight). She finally fell back to sleep around 1am and then slept til 7am. The nurse changed her diaper and picked her up and she fell back to sleep immediately. She slept til 8:15am, when she woke up smiling. She's had a surprisingly pretty good day today. She's had a few hiccups...she had a meltdown during PT this morning when the therapist was talking to her nurse and then again this afternoon right before OT when she had a huge liquidy diaper (one of two today). She had moments where she would get very vocal and sound agitated, but they were far less than yesterday. Overall, she was a little more calm today, so that is a good thing. I didn't really hear her doing the chokey/coughy thing during the day, but tonight she did it a little. She's still very congested in the nose. Not sure what that's about, but her brother has got it too. I don't have it, so I'm guessing whatever it is, it's not allergies (or I'd have it for sure). Still hoping and praying for more good days for my girl! Reagan slept all night last night and then woke up this morning in a seemingly good mood. She's been smiley, but she's also had her moments today as well. She did fine for OT this morning, but shortly thereafter when her speech therapist was squeaking a toy, Reagan went ballistic and I had to go in and calm her down! She's actually done that several times today. Something sets her off, whether it's a toy, therapist, mommy (yes, me getting any where near her tonight was setting her off), and she gets crazy vocal and almost in tears! She's still very congested and her nose is runny. She's doing this chokey/coughy thing again, but I really do think it's because of sinus drainage running down the back of her throat. Poor thing. I hope it's nothing. I also hope she can somehow manage to give us a few more decent days because we've just had way too many bad days lately. The last two Fridays in a row were BAD days...I really don't want to continue that streak! And then there's brother! He has been awful today...especially this afternoon/tonight. I'm not sure if he's not feeling well or what (his nose has been a little runny too), but at one point tonight I couldn't get him to stop from crying! If he's not better by morning, we'll be heading into the pediatrician first thing! Please keep these two in your prayers! We all could sure use some better days! Reagan was a little resistant to go to sleep last night. Mike laid down with her, but she kept tossing around. She appeared to be asleep when we went to bed. I'd wake up every now and then and check the monitor and it seemed she was awake. She was moving around a lot. Then I had to get up with Ryan and I saw big glowing eyes, so I knew she was awake. So after I finished with Ryan, I went in her room and immediately I could smell it! Formula! Her extension had come out of her button and was pumping all over her and her bed! Who knows how long she had been laying in a cold, wet bed (because she can't tell us)! Poor girl! I changed out her sheets, her clothes, her diaper, and then put her back in bed...she was asleep within 5 minutes! And then she slept. And slept. And slept!! She really only woke up once today right around noon, just in time for speech. Unfortunately, she only made it through 15min or so of speech before she was out cold! So we went ahead and got her dressed and ventured out into the pouring rain for her AFO appt. Nothing was waking this girl up! Getting her out of the car in the rain, stretching and casting her feet, putting on her harness and loading her back up in the rain...nothing! This girl can sleep! That is, on her sleepy days! Most of the time she's a very light sleeper...but on days like this, nothing wakes her up! I'm hoping she sleeps through the night and wakes up a happy sweet girl tomorrow (her therapists and teachers are hoping to see her)! Last night was a really bad night for our girl. She fell asleep and was asleep only for only an hour or so when she woke up screaming! Mike went in and tried to soothe her but the screaming was relentless. I went in only to find her wild eyed and thrashing back and forth with each scream. I don't know if it was "night terrors" or just some other neurological manifestation, but it was scary and it lasted 30min-1hr. When she finally settled down, she was still very tense and had the crazy laughs again. 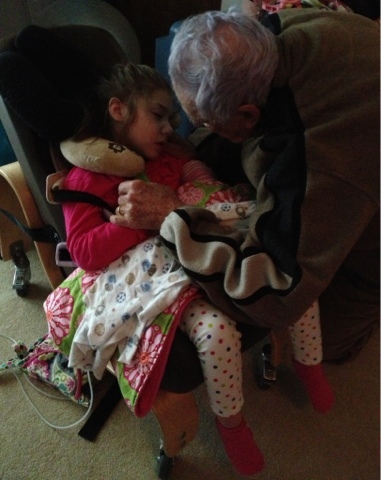 Mike was able to get her to fall asleep, but every time he tried to get up, she'd wake back up! Finally he thought he had her asleep and came to bed, but she was awake by the time he laid down. She was OK though and she just laid there awake until morning. Ryan also had a rotten night, waking up twice before I ever got to bed and another 4 times afterward. Needless to say...we had a rough night last night. Thankfully, my girl woke up this morning and was a little more calm. Overall, today has been a better day than yesterday. She's still had the occasional crazy laughs, but she's been more calm and quiet today. She was a little nauseous this morning, but I think her throat just hurts from all the crying last night! She's got this deep throaty voice today, so she's definitely a little hoarse. She's still tense and having some temperature regulation issues (and holding her urine tonight)...but sweet and cuddly and super precious (and missing another tooth...Daddy finally yanked her front upper right tooth out...the one she knocked loose on Saturday). I'm definitely holding her a little tighter tonight. Today I found out that precious little 8yr old Kyle passed away after a long fight against mitochondrial disease! So sad. So sad. And little Lucy is in a fight for her life as well...please say some extra prayers for her tonight as she is going under anesthesia tomorrow for another procedure! 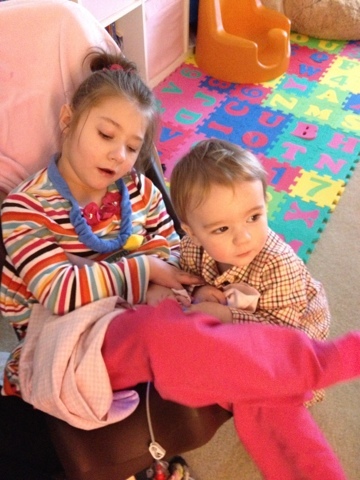 Two more reasons we so desperately need to raise awareness and money for mitochondrial disease research! Reagan slept well again last night...and so did her brother!!! FINALLY! He only woke up once around 3:30am and I found him standing up in his bed talking to himself. He went back to sleep and didn't wake up until after 7! I'm still in shock! Reagan even slept in this morning til 8:30am! We could tell right away that she was a bit off this morning. She had the laughs and just seemed a little more on edge. As we were getting her ready to leave to go to get her gj-tube changed out, she escalated a bit, making me nervous for our trip. Thankfully her brother fell asleep and was quiet our entire drive in, so we didn't have to worry about him aggravating her. She was great for her tube change (as always) and we were in and out in a flash! Our appt was at 11am and we were in our car driving out of the med center by 11:45am! (Note to those who have their tube changes done at the other hospital that requires anesthesia for such a simple procedure!) As the afternoon went on, Reagan's sensitivity increased. She had a big poopy diaper and seemed a little more agitated after that and then her brother started up crying and that was IT! She started crying and we had a big mess on our hands. Ever since then, she's been completely on edge and on the verge of tears at all times. I tried both Ibuprofen and Lortab...nothing. I'm hoping clonidine will do the trick and help her sleep tonight, otherwise we're in for a LONG one. Please keep our girl in your prayers tonight! She needs a break from all of this...one day is NOT enough! 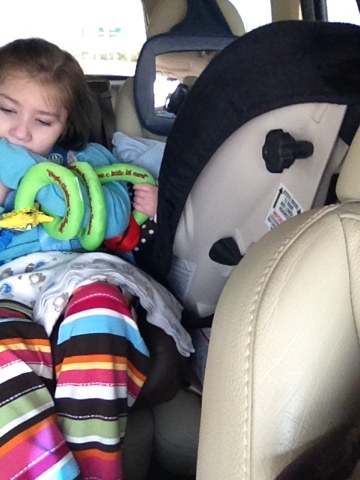 On our way home from the hospital...notice Ryan's hand latched on to Reagan's toy! He would NOT let go!! Reagan actually slept fairly well last night. I wish I could say the same for her brother. He's still not sleeping well at all. 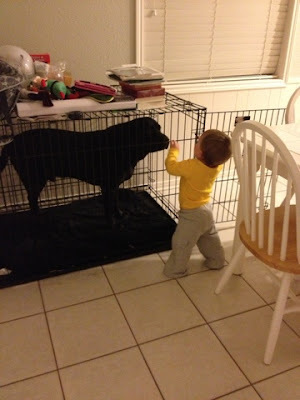 He's blaming it on teething...but I'm beginning to think we've got a manipulative troublemaking kiddo on our hands. Reagan woke up this morning still very moany/groany. She's very hoarse and it's so sad to hear her pathetic moans and groans. Her lips are also so dry and hard...I guess from sleeping with her mouth wide open! She's slept off and on most of the day and this afternoon (after she had a huge liquidy diaper) she was much less moany and seemed to be feeling a little better. We were finally able to take off her arm restraint. She's still pretty zoned out, but her temperature regulation seems to be back to normal. I'm hoping tomorrow she'll be well on her way back to good days again. Grandma comes in tomorrow, so she's really hoping for some smiles while she's here!We've got a busy week next week with school starting back and a couple of doctors appts. Thank you for your continued prayers for our sweet girl. If you could, please say some extra prayers for Lucy, she's not doing well and could really use them right now!!! Reagan slept fairly well last night. Ryan did wake her up this morning at his usual 6am wake up time. You could tell she was already a little agitated...and then it escalated! It was a full on bad day today. I hate that. I feel like my girl just can't catch a break! She had a bad day last Friday as well! Too many bad days (and on edge days) and not nearly enough good days (I don't remember the last time she had a 100% good day). She was crying A LOT this morning..real tears. She'd doze off for short periods of time with the help of Ibuprofen, Lortab, and Clonidine...but nothing lasted very long. Our nurse had to leave early today so the agency said they had found someone to finish her shift. Then less than an hour before the switch, they call to say the other nurse can't make it! 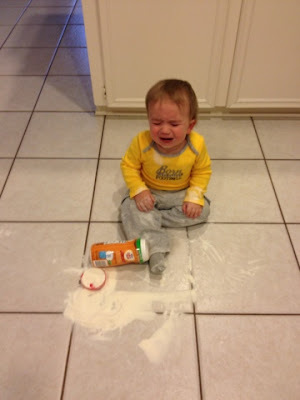 I was so mad, I could hardly stand it! So I decided to call our beyond sweet neighbors that have been offering to help for forever but I had never taken them up on it. Today was the day! 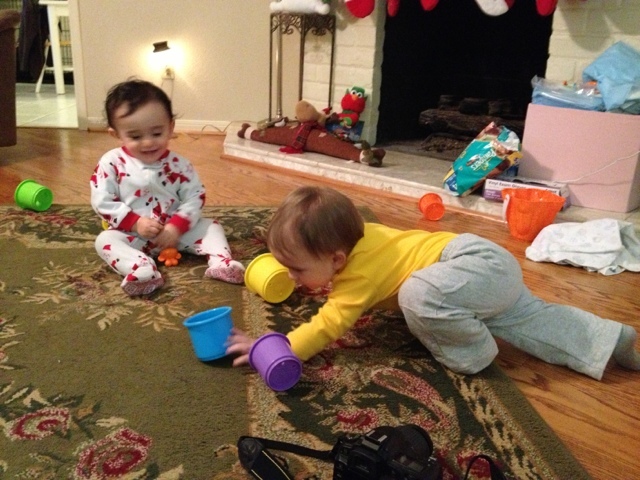 They came right over and Uncle Johnny sat with Reagan while Jackie helped with Ryan! This was the first time they had actually seen a real bad day first hand. I think it was a little shocking to them. Johnny just sat with Reagan talking to her and rubbing on her shoulder and he actually got her to doze off a few times! So sweet! I'm sure they were wiped out when they left. Thankfully Mike was able to come home a little early to relieve them. Tonight Reagan was more moany/whiney. 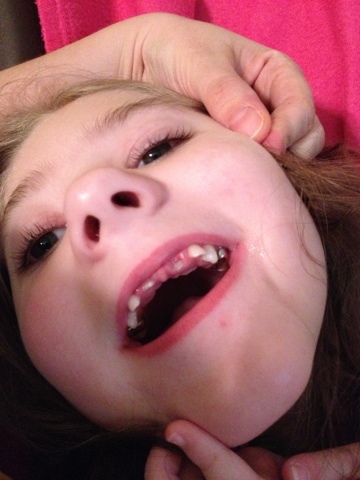 She must have yanked or knocked her tooth a little because her upper front right tooth was all bloody and loose (both of her top front teeth have been loose for months now, but still haven't come out). Tonight we tried a dose of the Toradol (super strength ibuprofen). It didn't seem to do much. The Morphine had to be special ordered so we won't have that til next week. I just hope she's able to sleep tonight. She so needs it! My sweet girl! She goes through so much! Please keep her in your prayers! 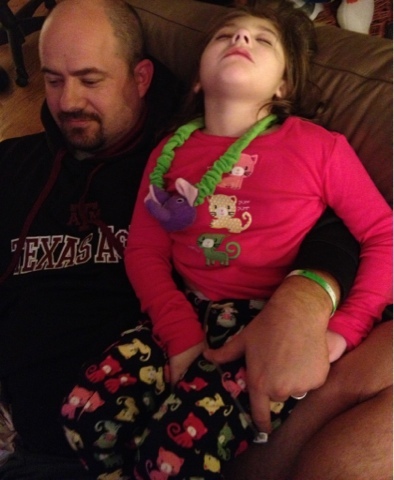 Snoozing (and snoring) on Daddy...like father, like daughter! What Ryan was doing right before our company arrived!!! What am I going to do with this one?? We have exactly one month until the 2013 Houston Energy for Life Walkathon! Last year was amazing, we had so many friends and family come out to support us (despite the cold and rain)...it really was a great experience! Not to mention, we raised almost $11,000! I admit, I do get a little down about how each year it gets harder to get donations. I guess people think, "But I donated to that last year! Done!" But it's not done. There is still no cure. And as parents we have to sit and watch as this "rare" disease (which is far more common than people think) takes our kids from us! 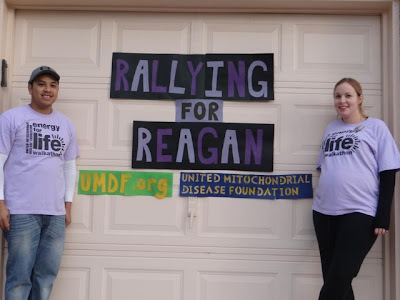 Please help us to spread the word...the only way to find a cure is to increase funding to mitochondrial research...and the only way to increase funding is to increase awareness!!! If you live in the Houston area, we would love for you join us on February 2nd at 2pm at Sam Houston Park (Downtown). 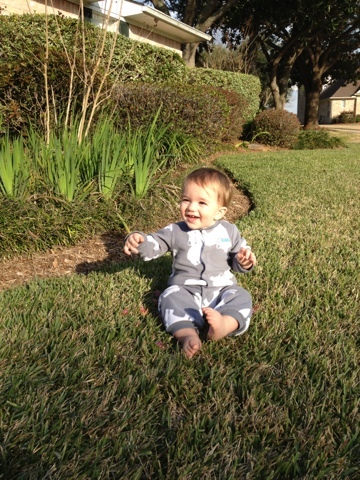 You can click on this link to join our team Rallying for Reagan! And if you don't live nearby, you can still participate by donating or just by talking to someone about mitochondrial disease and a precious girl named Reagan who has it! Thank you for your support and thank you for your continued prayers for our girl!!! Reagan slept well last night. She woke up smiling this morning and has been a good girl again today. She still has her moments where she makes a high pitched squeal and seems like she might cry...but so far, so good. No tears. She was especially sensitive today as we were taking her out of her stander and her brother started crying...she did not like that one bit! Her eyes got red and I saw the fat lip, but we avoided a meltdown. Her temperature regulation has been slightly off today. Her face will get flush and hot and clammy, while her hands and feet are cool and clammy. Her nose is a little stuffy but not too bad. She's also still a little chokey/coughy here and there, which makes me really nervous considering she's been exposed (again) to the flu! My dad said my stepmom is really miserable right now! Then tonight I got a text from Reagan's night nurse and she said she's been coughing a lot and has flu like symptoms!! Great! She carried Reagan around nonstop Thursday and Friday nights last week! I just want to reiterate that you CAN get the flu even though you've been vaccinated (they only vaccinate against one strain, so you can still get other strains)...and not every one gets a fever with the flu either!! My stepmom was vaccinated and still got it, and while Ryan had a high fever, I never had one at all! Please be careful!!! That cough or sneezing you're doing could be more than just allergies (and you could be extremely contagious)! The flu can be lethal to someone with mitochondrial disease! Please keep our girl in your prayers...she definitely needs to avoid this one!